MATERIAL: We provide Classic Designed and stylish New Easy to carry Lunch bag. Made of 420D Jacquard fabric, PVC. This Star Wars Deluxe lunch bag features a top carry handle to make it easy to carry. Insulated and ultra-cool that keep your food cool and organized. SIZE: Ideal size for Easy to Carry and the Dimensions 9.5″ x 7.5″ x 3.75″ – 24cm x 19cm x 9cm. For its medium size, it is flexible to carry and packaging. FEATURES & DURABILITY: Stay comfortable and feel free all year long with super fashionable and Exclusive Lunch bag. Lightweight makes it easier for carrying. It’s also soft sided and insulated. COLOR INFO: Exclusive combination of color makes it Eye Catching looks for kids. 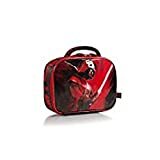 The lunch bag is red in color with Darth Vader The Star Wars character in front. WARRENTY: 100% official licensed product. Customer satisfaction is our top priority, return accepted if you are not 100% satisfied as long as the products are also brand new and can be sold again, accept “no questions asked” returns for 100% refund or replacement. Star Wars Lunch bag – Darth Vader The Star Wars Kids Lunch Bag Collection by Heys has been designed with the unique characteristics of children in mind. High-quality fabrics such as 420D Jacquard fabric and PVC materials are used to further enhance the visual appeal of the Lunch Bag. Detailed matching zipper pullers and embroidered labels have also been used throughout. Apart from the use of popular Star Wars characters, these lunch bags incorporate key design features that benefit children. Features such as lightweight and spacious, these lunch bags have printed thermal pockets, and a name tag equipping these lunch bag for day-to-day use, travel or back-to-school. All these features have been designed to make these lunch bags as functional as they are fascinating.